Lotto fanatics will surely enjoy the offerings in LottoRace, which is an online lottery site. It allows players to choose their preferred numbers and race with the other players in order to win. The company is running with a license under the jurisdiction of Isle of Man and United Kingdom. The site has its interesting history. In 2011, LottoRace simply started in Facebook, the famous social media platform. Initially, the site is only made for fun. Facebook users can join the Lotto Race app for free and play with virtual chips. A lot of Facebook users really enjoyed the game. In fact, more than one million players all over the world are placing their bets in this virtual lottery site. After several years of gaining huge number of followers, it turned into a real gaming site. Bonobo software is the platform provider of Lotto Race. There an option for an instant play offered but the downloadable software installer can also give players a wonderful gaming experience. For players who are always on the go, the mobile version of this brand is also accessible. This means players can place their bets wherever they are. 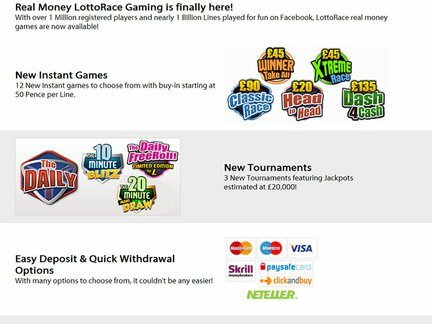 Upon joining the site, new players can immediately receive £ 5 LottoRace bonus for free. Newbies can get it even without depositing any amount of money. Once the new player made his initial deposit, he will receive another 200% credit up to £ 30. These promotions are really great ways to start a journey into bigger winnings. Each game in the site has a guaranteed winner or winners. The odds of winning can go as high as 1 in 2 up to 1 in 20. The good thing about this site is that players are allowed to choose their odds by selecting a high or low risk games. Players from American Samoa, Guam, Northern Mariana Islands, Puerto Rico, U.S. Virgin Islands, and United States of America are restricted to join the site due to some laws and regulations. Customer support of the site can be reached via e-mail address. So far, there is no known complaint against the company. With their high chances of winnings and ease of accessibility, LottoRace deserves a 5 out of 5 rating.